This is a sauce my grandmother used to make. Meant to be served over mixed greens or can even be used as a cocktail dip. I like it over a mixture of steamed rice, egg, and steamed vegetables. Awesome! Add chili powder, soy sauce, sugar, and lemon juice. Cover, reduce heat to low, and simmer for 15 minutes. Stir frequently. Made this and used lower fat peanut butter; worked really well. Fantastic as a side salad to chicken and rice. Also good as an appetizer! I absolutely love the sweet and complex flavor of this sauce. It is delicious with all types of raw vegetables. It also helps cut a very spicy dish, so try it served alongside one of those. 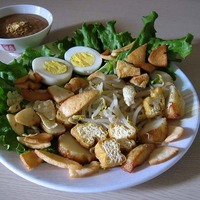 Gado-gado is one of my favourite meals. We used to use whole fried peanut instead of peanut butter, here in Indonesia. Yum ; I usually do not care for many American recipes as they usually contain at least one ingrediant that is store bought and mass produced ; that is not home cooking ... But this Gado Gado recipe can easily be forgiven for using Peanut Butter . This looks interesting. Would be nice to try. Awesome recipe - reminds me of my Big Acres Chipotle Peanut Sauce! Check out the recipe on my page for Chipotle Peanut Chicken Tostadas - this sauce is perfect for this recipe! I've tried this recipe - it's amazing, and surprisingly easy to prepare.